Launchpad couldn't import bug #32948 from freedesktop.org Bugzilla. Note: Thunderbird is installed & working on both machines. profile directories and share nothing with other apps. This means that the browser and mail now conflict with each other. if you've got e-mail open...". on another desktop, out of view rather than in front of the user. running instance so that it could open up the appopriate window. less objectionable on X Windows if we could get the same kind of behavior. apparently discards/disregards votes for the previous bugs that were so handled. The brings up questions as to how accurately it's impact can now be judged. this bug is, IMHO, misleading. suddenly things have gone pear-shaped. window is hiding, and then Ctrl-N / Ctrl-1 off that window. was now officially the same bug. (!). issue or not. If it is, I could not find it. the files directly (better: write them). located in a networkwide lan where ports can opened and connected in them. if the first instance of the application dies, another becomes the writer instance. the problem but not the solution. provide assistance in using it for this job. Thank you. able to leverage to share the other profile data. profile corruption, deadlocks, or any other Bad Stuff(tm). about the design we are working on for sharing the profile data. asked would settle for a message that says "Close the other Mozilla first"
instead of the new profile setup prompt. Another solution would be a simple prefs.js setting to disable the locking. -- in most respects it seems almost the opposite. It seems no matter how I open Mozilla, only one instance is created. there is a way(s) to open an application so a new instance is created. crashes, this new instance does not crash (unless the crash kills all of Windows). those that are part of some other instance remain open and functional. there is some other bug that it is truly a duplicate of, but it's not this one. Setting to milestone that's not passed. times, you will not succeed (Office XP at least). I would really like to see the ability to launch Mozilla in multiple processes. based profile/configuration service/daemon would be very useful. Well thank you, but it has been reported as fixed on master, and so therefore may or may not be backported for 3.4.4 (not my decision). I will try this again on one of my own recent Linux 32bit master builds and see if I confirm Julien's findings. > may or may not be backported for 3.4.4 (not my decision). > if I confirm Julien's findings. On my own week-old 32bit linux Ubuntu build from master, I can see various choices for existing database connections, among which Thunderbird and Seamonkey address books. 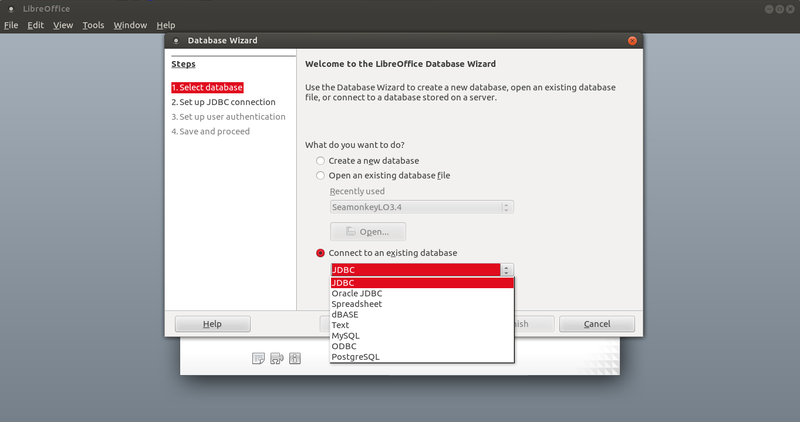 The ODB file can be created just fine, however, the wizard does not pick up the user's TB/SM profile, and thus can not actually make the connection to the mozab underlying database file. Even if I save the ODB file, re-open and then try and reset the properties of the ODB connection to point to the mab file, this still fails to work. So as far as I'm concerned, my tests were inconclusive. I can't tell whether it is a problem in the connectivity code or somewhere else, because there is not much point in listing the available types of database if LibO can not actually connect to them. On the other hand I have some databases in my libreoffice repository. > driver was found for the given URL. > On the other hand I have some databases in my libreoffice repository. I can confirm this too on 32bit Ubuntu Oneiric 11.10 with distrib supplied LO 3.4.3, so the fix is still not in for that version. So would this be one for Bjoern ? 1. Purge ubuntu libreoffice packages with dpkg --purge --force-all "libreoffice*"
2. Install 3.5.0beta0 binaries from libreoffice.org. 5. Open "File->Wizards->Address Data Sources..."
7. Select any of these. A dialogue appears saying "The connection to the external data source could not be established. No SBDC driver was found for the given URL"
8. Click on "More" in this box. The error shown is "SQL Status: HY000. The connection to the external data source could not be established. No SDBC driver was found for the given URL." 9. Click on "Information". The description is "A connection for the following URL was requested "sdbc:address:evolution:local". I have libebook-1.2.so.12 installed in my system, which doesn't match any of the above. I suppose we could just try adding libebook-1.2.so.12 to the list to see what happens. and have the issue in 3.4.3. @NoOp: that's what I saw on 3.5.0beta0 too. Interesting that it's not just a problem with the library version being wrong. added to eBookLibNames. Now I only get the option of the "External data sources" and when I click on that I get the same error as you, with the Information that "A connection for the following URL was requested "sdbc:address:evolution:local"." seems to use a lot of these deprecated symbols. I've love to have the time-expertise to hack around, but I don't. I'm going to have to move to good old-fashioned handwriting for my Christmas card envelopes. Confirming on my 3.5 build from master Linux Ubuntu 32bit, that only 1 entry is present when the wizard is started "Other external data source". If I click Next after having chosen this possibility, I get an error messsage of the type : "The connection could not be established. No SDBC driver could be found." So confirming other peoples findings too. This really needs sorting out. have to move to good old-fashioned handwriting for my Christmas card envelopes." In my latest build from master, on Ubuntu Oneiric, I have several entries, including Evolution, Evolution (LDAP), other DB, but NO Thunderbird (which is most annoying, but not really surprising since I disabled building mozab within my build because it doesn't build within the LO code on Ubuntu (sigh). However, the basic functionality of the Address Database Source Wizard does work. For example, I could set up and define a mysql database as an Address Datasource, just as I could with the Evolution address book. So, FWIW, this works for me (apart from TB Address book integration) on Linux 32bit Ubuntu Oneiric with my build from master. I hoped that LibreOffice 3.5.1 would solve the problem, but after an upgrade from 3.4 in Ubuntu Oneric 11.10 (64-Bit) the same problem persists. A connection for the following URL was requested "sdbc:address:evolution:local". It is encouraging that the importance has been raised to critical and I hope that somebody will be assigned for LO (ubuntu) soon. Thanks for working on this. I need the feature desperately. As it seems NoOp reproduced with LibO vanilla build 3.4.0beta3, so together with other confirming comments I believe we can this one take as NEW, also due to other builds. Is my addition to summary line correct? Can you please keep at it and check whether the "fix" is enduring? Any ideas? This one seems to be really tricky, I see several conflicting observations. For goodness sake. TEN YEARS and an issue is still "new". In a commercial environment someone would be sacked. You cant run Firefox in a remote desktop session or under Citrix if another session already has Firefox open. This is a pretty big defect. Frankly, this is the achilles heel of "community" software. Lots of voluntary work on building a Ferrari ... but because it is not managed as a consumer product ... you cant drive it on Sundays between 2 and 3pm. The thing that really ticks me off after 20 years in the industry is techs nodding their heads and saying "yep, that's to be expected". Sorry, just because you can come up with an explanation doesn't mean "its OK". Any workaround is better than closing umpteen "duplicates" and leaving an issue open for 10 years. Come back in 2050 and this will probably still be open. Am I really the only one who is ashamed to say I'm a software developer? This is exactly the sort of thing that sees software guys get mocked by business people (well actually anyone for that matter)... and fair enough too. Firefox as a browser is in my opinion the best (except for this particular problem) ... all the man hours that some extremely talented and selfless people have put into the tool is amazing .. only to be let down by a failure to look at the whole... as a tool used by people ... to address real usability issues ... which after all is the point. Do you know that in real engineering disciplines people construct whole buildings? that stay standing? that can be used all year round? That take technology and engineering and apply it to _people_? that can be constructed in days? to budget?!! ... such a revolutionary concept. While "db" has been very generous with his time to provide his script I don't think this will help my grandmother. Yep, Im an angry old man .. the thing that makes me a sad old man is that this sort of failure is why open source and community software hasn't quite conquered the world how many predicted. Instead a commercial layer appears in between .. a layer that "tweaks" all the effort of selfless individuals to get to an actual product that delivers... and that commercial layer then chuckles it all the way back to the bank. Mike S - Not disagreeing a bit. There are also other significant flaws in FF4 and up (dysfunctional default UI, rapid release cycle, the 'fix' for bug 586234, inability to clone a tab). I don't think it is necessarily a reflection on all software developers, not even on all who work on FF. My guess is - and that is true for commercial software as well - some folks with a far too big ego make the decisions and they want things to be their way. The UI change that nobody wanted - still there. The rapid releases that still break add-ons and that caused hundred thousands of complaints - still there. All the stuff that works fine in FF3.x and was broken for no reason in FF4 - still there. I think that up until FF3 Mozilla was close to the community of users and made a browser that users loved. Then something changed, a decision was made to copy Chrome and entirely ignore the wishes of the user community. What Mozilla needs to do is replace the decision makers with folks that care about the users more than themselves. FF turned into the materialized ego trip of a select few and the result is unhappy users and continuously dropping market share. I really wonder how the decisions are made which bugs to fix first after covering security issues. My guess is that new (and buggy) features trumps fixing bugs filed a decade ago. And the memory leaks are still there, but that is a common occurrence in FF since version 1. As far as sharing a profile is concerned, I think that it is even more a need for Thunderbird. You wrote that you are a developer. I know it is a common response that gets used too often, but maybe you can take on this issue and fix it? I wish I could, but I am just a QA buff and a regular user aka someone who the FF folks give a damn about. Who's idea was it to feed upstream bug comments into this launchpad bug report? Firefox (Bug 135137 - Profile data cannot be shared by multiple running instances. ) has absolutely *nothing* to do with this bug report. - May be related to 32 bits / 64 bits; works on 64 bits, fails on 32 bits. - May be related to version of libebook installed and deprecated / removed symbols; see comment 47. Any future testers, please *always* say whether you use 32 bits or 64 bits, and what libebook-*.so* you have on your system. Thanks for that. OpenSuSE 11.4, 32bit, LO 3.3.4 and LO 3.5.4.2 → connection works, no content is shown (may be another problem). OpenSuSE 12.1, 64bit, LO 3.5.4.2 → no SDBC-Driver for URL. When I search for more Information the URL "sdbc:address:kab" was not found. I think it could not be found, because the right URL has to be "sdbc:kab". Thats the URL I see, when I open Extras → Options →LibreOffice Base → Connections. Hi NoOp (glgxg)! Your comment regarding address data sources is very interesting. How did you uninstall the official Libre office (12.04) and install the non-Ubuntu version of LibreOffice? (I run Ubuntu 12.04 (AMD64) with LibreOffice 3.5.3.2). > When I search for more Information the URL "sdbc:address:kab" was not found. > I think it could not be found, because the right URL has to be "sdbc:kab". > Extras → Options →LibreOffice Base → Connections. I think "sdbc:address:kab" is the right one. I don't see either in my (the default) "Extras → Options →LibreOffice Base → Connections". > Tried to connect KDE-Adressbook. I'm going to assume this is *not* related to 32/64 bits. 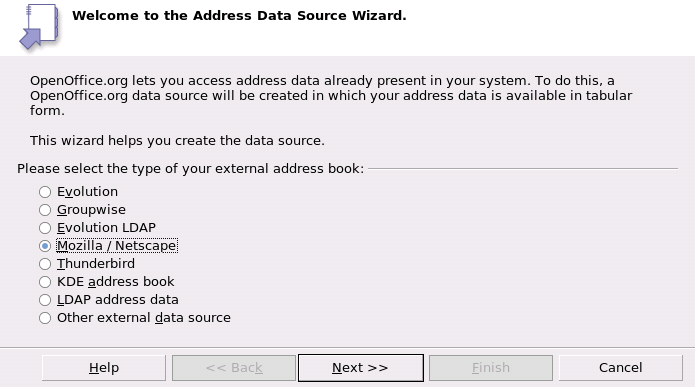 1) Do the right options appear in the "Address Book Data Source" wizard? 2) Do these options work as expected? Each missing, and each not-working option could be a *different* bug. One of these multiple bugs could be linked to 32/64 bits. Especially, the libebook discussion should be relevant *only* to "does Evolution appear in the list / work", and not to any other entry. The first two don't work, saying that no address book directory is available. As this is very well possible (I don't use any of these programs), this does not necessarily indicate a bug. LDAP: seems to work, don't have an actual LDAP server to completely test. 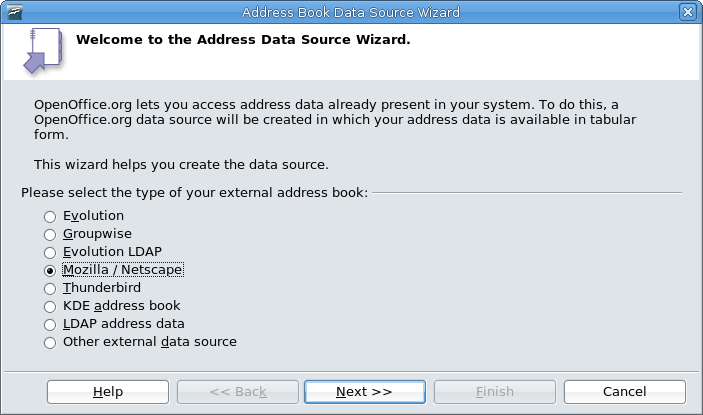 I don't have KDE address book listed: duh, I don't have KDE installed. I don't have evolution address book listed: I don't use Evolution, so maybe not a bug. Maybe still a bug. E.g. for LDAP, the Debian LDAP directory may do (I don't know). If the issue is "all entries missing" (or "all except Other"), that's probably a single issue. Don't open a bug per missing entry. But if *some* are missing, probably multiple issues (exception: Evolution, Groupwise and Evolution LDAP are served by the same driver, so if all three are missing,l it is a single issue). Same for "some/all not working". > The first two don't work, saying that no address book directory is available. > not necessarily indicate a bug. For me, I can set up and connect to a TB addressbook via the method you describe, ie. 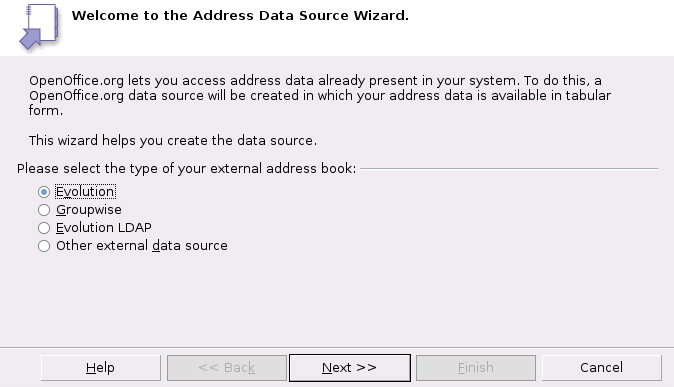 via the wizard, on master build from 30/08 64bit, so Thunderbird as an address datasource WFM. FYI i am working on Thunderbird Address Book (mork) driver implementation that doesn't depend on any mozilla code. Currently it can already import the deafult AddressBook. And almoust the whole range of SQL query constructs is supported (compared to mozilla based implementation). Any more joy in finding / splitting out the component parts of this multi-issue bug ? if not perhaps closing it would provoke filing separate bugs for any remaining issues ? @Lionel: Evolution does indeed work just fine for me. I no longer get "No SDBC driver was found". However, LO defaults to the SeaMonkey address book when Thunderbird/Icedove is selected. But of course that is for bug report other than this one. [Address data sources missing] Note this bug report was originally reported by me a few years ago on Ubuntu's OOo. Unfortunatly, that bug report has been intermixed with this one so much that I gave up on it some time ago. You are right, there was enough time for that to happen, now closing. as per #215 fixed in upstream 3.5 and later (so precise and later). For more information please see: https://bugs.freedesktop.org/show_bug.cgi?id=51004 "
This product was supplied by The Document Foundation, Debian and Ubuntu. Displaying first 40 and last 40 comments. View all 252 comments or add a comment.